Just a year ago, I received a call: “Can we ramp up a program to help our deacons broaden their evangelization outreach?” It was a great question… one that I pondered, prayed upon and researched for several days. In the end, it occured to me that Twitter, of all the social media possibilities, offered a great potential. and brevity of Twitter appealed to me. And it offered a perk (at no cost), TweetDeck, a platform for providing a single twitter account for an entire organization to use. Hmmm… now that had potential among 75 active permanent deacons in our diocese! Sparing you the back story, TweetDeck now embraces @deaconspeaking. That’s a twitter account that, “is the official Twitter Team account of the Deacon Community, Diocese of Syracuse, New York. Our goal is to evangelize to all people.” We don’t have many followers, yet, but we’re working on it. How? First, deacons are signing on as members of the TweetDeck Team. Secondly, we’re learning how to leverage popular tweets. Pope Francis is a great example! He usually receives 20-30 thousand likes on each tweet. Well, we broaden his message by drilling down into scripture. This requote/retweet of the Pontiff’s message on Friday in the 5th Week of Lent is a good example. We simply reflected back to the original Gospel passage that his incredible tweet is based upon. It provides a vehicle for a meaningful message on our part as a deacon community, but more importantly, it grounds Pope Francis’ message in the scripture that our parishioners encountered on Ash Wednesday. 1 – 2 -3… IGNITE! What better event to launch the use of our new Syracuse Deacons Community @deaconspeaking Twitter Team account than to share our diocesan Catholic Men’s Conference, IGNITE! There was so much to share at this year’s event that coincided with the Solemnity of The Annunciation. 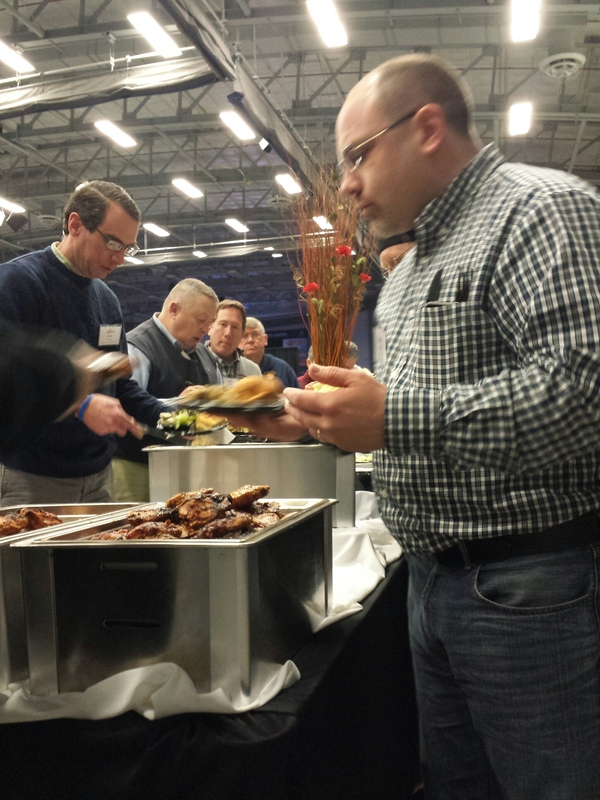 Community – Ample breaks, plentiful lunch, solid vendor support with plenty of space to mix and meet others with shared interests. Six tweets during the day captured many of the conference highlights. And now, other deacons in the Diocese of Syracuse are joining the Twitter Team to ramp up our evangelization efforts. Steve Ray is at the podium now with a talk focused on St. Paul. Wow! Connecting us with a feisty Apostle Paul. Just 40 minutes ago Bishop Robert Cunningham opened this year’s Ignite Catholic Men’s with Mass and a Homily emphasizing the role of the father in the family, who is strong because he cares! Nearly a thousand men are here: Fathers, Sons, Old & Young. Hands of men Rising Up – Being Strong. Join us: Inspiring men, by the gifts and fruits of the Holy Spirit, to ignite their Catholic faith in everyday life. 1. What does it mean to suffer for Christ? 2. If Paul was here today speaking, talking about today’s culture, what challenge would he offer you personally? Each year at Ignite, hundreds of men participate in the Sacrament of Reconciliation. 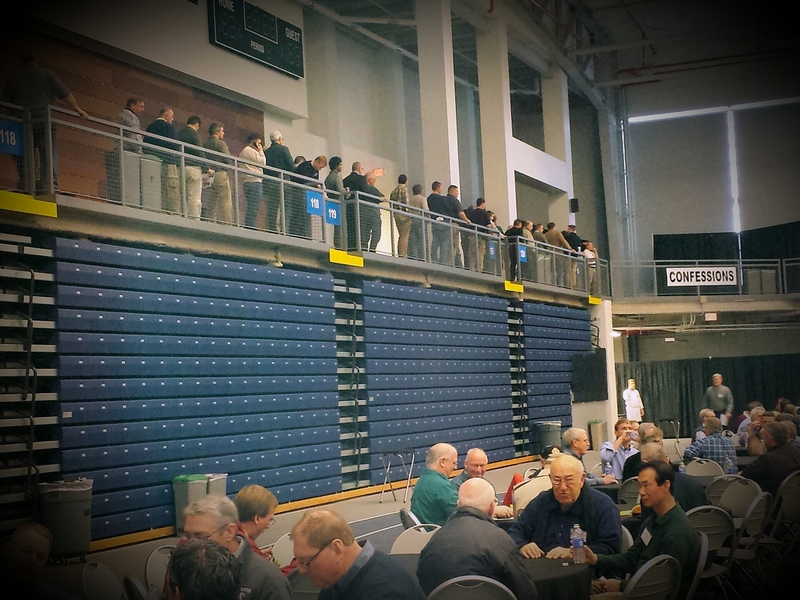 A small army of priests is on hand as men que in the mezzanine. 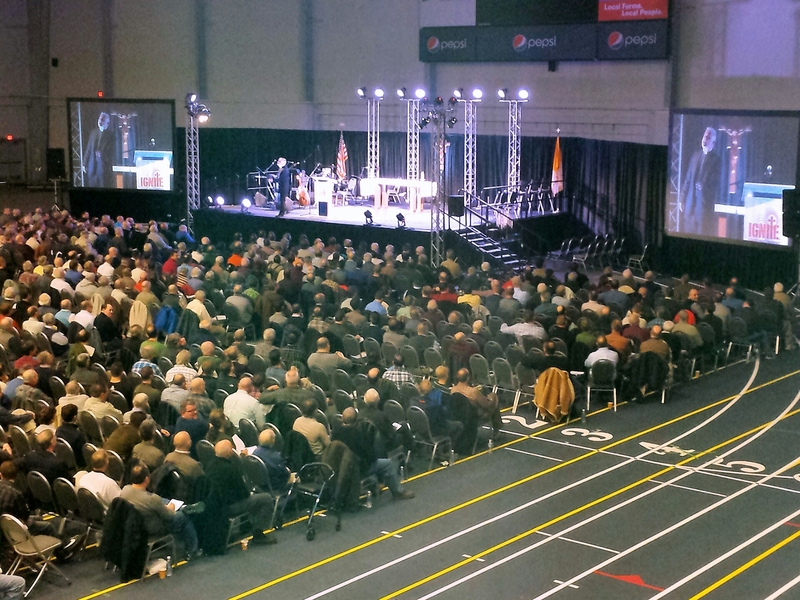 God’s grace is so manifest in the sacraments here at the Ignite Catholic Men’s Conference! 30 million have left the Catholic Church in the last generation. Food for thought! Curtis Martin Wrap-up: Three questions that roll out of the presentation. 1. What was your 4:00? 2. What area of the culture could you set on fire? 3. 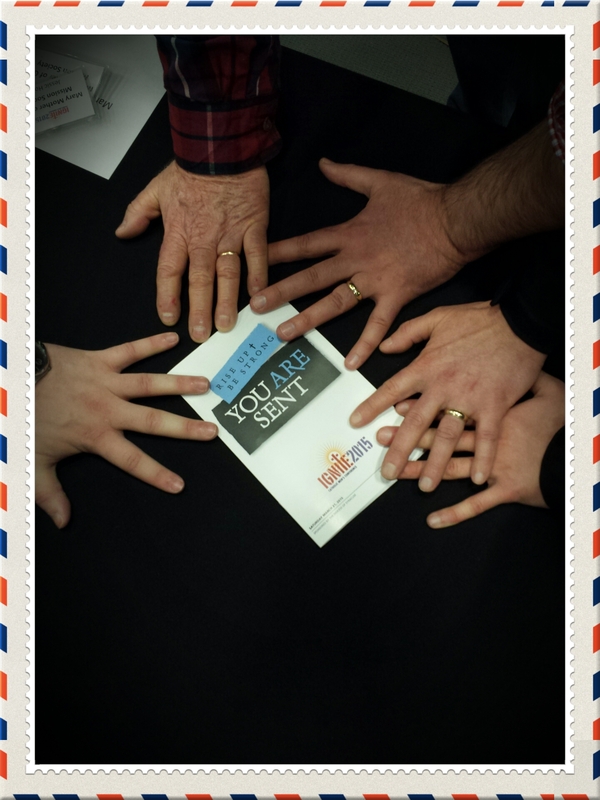 How will you gather a “band of brothers”? Saturday, February 27, 2010 men from all over the Diocese of Syracuse will gather to share, pray and experience the fellowship of being a Catholic man. 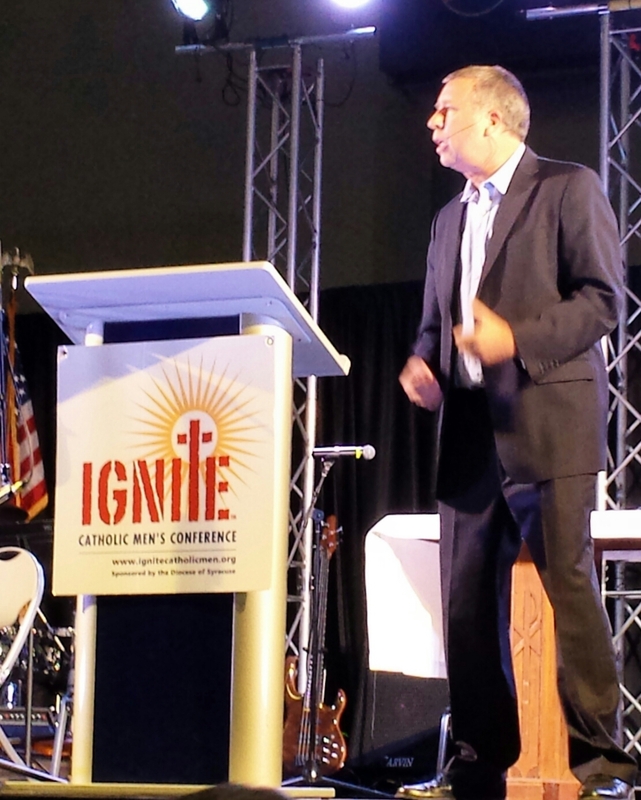 Ignite 2010 Catholic Men’s Conference will offer three nationally acclaimed speakers: Jesse Romero, Fr. Larry Richards and Sean Forrest as well as our own Bishop Robert J. Cunningham. Plan to attend and be part of a day-long experience geared for men, enriching our faith experiences and helping to build God’s Kingdom!